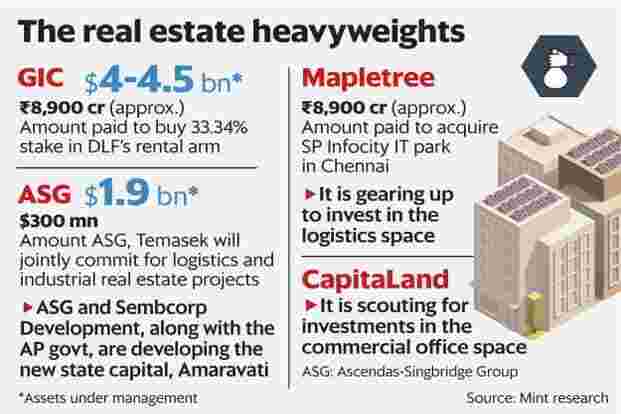 Bengaluru: Singapore-based investors and developers have over the years gained a firm foothold in India’s property market and are now venturing beyond commercial offices to bet on emerging sectors such as logistics, warehousing and urbanization projects. The way they are investing in other asset classes is much like the way they have deployed capital in India—patient and long-term—something that bears well in the country’s unpredictable regulatory and real estate scenario. Many of them have built a strong base in China and India was a natural choice among emerging markets. Singapore’s sovereign wealth fund, GIC Pte Ltd, is now one of the two leading property investors in India, along with New York’s Blackstone Group Lp, although the two have different investment strategies and return expectations. Another state-owned Singapore firm, Temasek Holdings Pvt. Ltd, through its fully or partially owned companies such as Ascendas-Singbridge Group (ASG), Mapletree Investment Pte Ltd and CapitaLand Ltd, has invested across asset classes. GIC has a diversified portfolio of around $4 billion of assets under management (AUM). In one of the largest property deals, GIC bought a 33.34% stake from promoters of DLF Ltd in its rental arm—DLF Cyber City Developers—for around ₹ 8,900 crore. Last year, GIC inked its first investment in a mixed-use project in Worli, Mumbai. In the past 20 years, Ascendas-Singbridge has built nearly 17 million sq. ft valued at S$2.5billion and plans to add 14-15 million sq. ft over the next few years. From being a pure office developer, it diversified into logistics and industrial real estate in 2017. It has also been appointed as a master developer for Amaravati capital city with Sembcorp Development and Amaravati Development Corp. Ltd.
“With strong macroeconomic fundamentals and commitment to improve its business environment, India is a key and strategic investment destination for Ascendas-Singbridge," said Vinamra Srivastava, CEO of Ascendas’s India operations and private funds. “The trend of flexible and agile spaces is rising and will give a boost to demand for co-working, modern offices and shared spaces, driven by a move towards a shared economy." Srivastava added that the company is in India for the long term, harnessing and growing local talent, developing infrastructure to attract businesses, partnering with the government and contributing to the local economy. On Monday, CapitaLand said it had agreed to acquire Ascendas-Singbridge’s stake in two of its subsidiaries, in a cash and stock deal worth $4.4 billion. The deal was expected to add scale in India and would become an important market for the combined group as it further develops new economy sectors, the firms said in a statement. In 2018, CapitaLand sold its stake in multiple shopping malls to Prestige Group. It is now scouting for investment opportunities in the commercial office space, said two people familiar with the development. In its second innings in India, real estate asset manager Mapletree made a comeback in 2018, acquiring IT park SP Infocity for around ₹ 2,400 crore, seven years after it had made its first and only investment here. This time around, it plans to not only buy office assets, but is also gearing up to invest in the logistics space. “Mapletree is an institutional investor and is looking at large acquisitions. In India, it will do a mix of acquisitions and work on brownfield or greenfield projects with select developer partners. On the other hand, GIC remains hungry for deals here and is sitting on a lot of capital," said a person familiar with the plans, who didn’t want to be identified. Spokespersons for GIC and Mapletree didn’t respond to queries. “While China grabbed the attention of the Southeast Asian investors, we have seen them returning to India after a break with renewed enthusiasm or taking new risks. The deal sizes are getting bigger and the success of other global investors here has also played a part," said Shashank Jain, partner, transaction services, PwC India. Bengaluru: Transparency, better government regulations and emerging sectors, such as logistics and warehousing, and urban projects, including the building of Andhra Pradesh’s new capital city, Amaravati, are attracting Singapore’s realty investors to India. Both GIC and Ascendas-Singbridge have been in India for a while, but in recent years they have ramped up the scale of investments and developments, besides diversifying their portfolios. Several among them have a strong base in China and, after growing big there, India was a top choice among emerging markets. The focus is primarily on rental assets, which assure secure, annuity returns.